Academic performance and eligible to graduate (minimum 2.5 GPA). Copy of transcript with school counselor initials from current institution are required. How does the legacy of the Buffalo Soldiers inspire you to solve a problem currently facing our society? 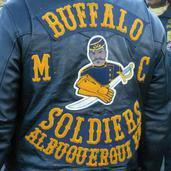 How will the Buffalo Soldiers Motorcycle Club, Albuquerque Chapter Scholarship help you? post-marked no later than April 10, 2019. Rene "Rooster" Matison at rpmatison@msn.com.